How Janelle Monáe's "Django Jane" reaffirmed my creative journey — michellcclark.com - More than what you came for. It’s 6AM. February 23, 2018. I’m on a flight. Window seat, but it’s too dark outside for me to appreciate the view. I just heard Janelle Monáe’s “Django Jane” for the first time, and it’s already on repeat. I’m already starting to analyze what I’m hearing before Janelle starts rapping. I can't help it. I try to avoid the use of hyperbole to describe artists whose work I love, so I have to dig deep. Comparisons won’t do, either. I feel slight turbulence as I continue to absorb the lush instrumentation, unshakeable confidence, and purpose driven message. This song feels like a victory lap, warning shots, and a true reflection of self. It’s powerfully supportive of Black womanhood, and easily one of her most political songs to date. “Django Jane” and “Make Me Feel" dropped on the same day, and I heard them a day after their release, which feels like an eternity to me - not because listening to new music a day later is inherently an issue, but because of the expectations I’ve created for myself. From September 2010 until February 2018, I ran a music discovery platform called Artistic Manifesto. For over seven years, a huge part of my creative identity was based on how I built and expanded that platform. Taking a day off or missing a big release felt like a crime. In the era of social media, where news can travel around the world in seconds, running a music blog is dependent on timeliness. Sharing a big record twenty minutes after everyone else shares it is too late, especially when you’re battling with publications that have larger followings and significant financial backing - hence my instinct to begin evaluating “Django Jane” while hearing it for the first time. Years spent trying to turn Artistic Manifesto into an impactful, sustainable venture has cost me the ability to differentiate between listening to music for pleasure and evaluating music as a means to determine if I want to share it on my platform. As the years progressed, my constant business-like focus on music made me more cynical about the music industry, hip-hop culture, and my place (or lack thereof) in the industry. When I launched the site, it was my only creative outlet. As I gained more confidence, knowledge, and experience, I discovered new talents and interests, and channeled them into multiple avenues of creative expression. Eventually, I found myself more drawn to telling my story and being myself on personal platforms than building a brand around the hip-hop itself. About a year ago, I stopped introducing myself as the guy who runs Artistic Manifesto. About four months ago, I knew it was time to let go. Three weeks ago, I finally took that step and spoke my truth. I had to let go of the world that I had created for myself in order to make space for exploring the world that is meant for me. That choice marked the end of one of the longest chapters of my life. Weeks after choosing to let go, I sat on that flight, listening to “Django Jane” on repeat, feeling affirmed in my new direction as I absorbed the song’s message and thought about its intent. I received a flurry of texts, emails, and tweets in the days following my announcement that I was done with Artistic Manifesto. My choice was jarring to a number of people, which I expected. I did not expect to feel so much remorse or fear. A lot of communication I received during this time made me nervous. I was forced to think about how many people knew me primarily as the guy who runs that blog. I couldn’t avoid those thoughts as the messages continued to pour in. I remember one text in particular that I got from a friend during this period. I’d love to pretend that my friend was right. It would be great if I could say that I left behind my first, longest standing, most definitive form of creative expression with a rock solid plan for my next steps already in place. I let go, without knowing for sure if the ensuing void would ever be filled. Despite close confidants, friends, and mentors advising me to give the decision more thought, I knew in my heart that my choice had already been finalized. I let go, because my long term happiness was more important than anything else. When I made that decision, I was fighting my way out of a dark mental space. The darkness is taxing. It affects everything that I do, and turns me into a more pessimistic person than I would like to admit. Despite having the best financial run I’ve experienced thus far as an entrepreneur, I was feeling less motivated. It was harder to get out of bed in the morning. I believe that laziness is a symptom of disbelief, and I had gotten to that point. I had lost faith in my ability to accomplish the mission that made me start my creative journey in the first place - sharing beautiful music with hip-hop lovers around the world without letting an artist’s popularity determine their worth. As time wore on, my schedule became increasingly busy, and I struggled to build a sustainable system. I began to deprioritize the site. I wasn’t looking to be more impactful or help more artists with Artistic Manifesto anymore - I was simply choosing continuity because it was easier than rocking the boat or disturbing the routines that I had created for myself. I battled my own thoughts for months, but eventually I had to be honest with myself: being a music blogger wasn’t a passion anymore. I didn’t have the mental or emotional capacity to keep up with such a taxing endeavor. “Maintaining” wasn’t enough. Trying to “maintain” wasn’t doing much of anything for anybody in a world that changes so rapidly. Embracing my truth was empowering, but the subsequent void has been disorienting. I was a nineteen year old college sophomore when I started Artistic Manifesto. As I move on to write new chapters, I am a 28 year old man. I should have moved on sooner, but I’m still happy that I made the choice. It’s not easy to let go of comfort or familiarity, even if the maintenance of those comfortable routines is hurting you. Letting go of comfort is necessary if personal progression is a priority. I was starting to settle into this train of thought before my flight, but after digging deeper into “Django Jane,” researching the way she’s describing her second album, and thinking about her history as an artist, I felt even more affirmed in my choice. When my flight landed and I got settled, I used my free time to obsessively find more information about the song that captured my attention and resonated with me. I stumbled upon an interview with she had done with Beats 1 Radio to supplement the release of “Django Jane,” “Make Me Feel,” and their corresponding visual accompaniments. As I listened, I learned that both songs would be featured on her next album, Dirty Computer. In regards to the project, Janelle told radio host Zane Lowe: “I always knew that I had to make this album. I actually had this title on this concept before my first album The ArchAndroid and it scared me because a lot of the things that I knew that I needed to say were very deep, very personal, from the heart." "You know, this is an extremely vulnerable album and it took me a while to make it because I’m a self editor. I self edit myself a lot. I’m like I don’t want to talk about this, I don’t want to talk about that. I had to kind of have people at Wonderland on my team to hold me accountable to it. They were like ‘OK, you said you wanted to make this album before your first album, this is the opportunity for you to just really choose honesty over mystery.’"
Upon reading this quote for myself, I reflected on the fact that Janelle’s first album, The ArchAndroid, released in May 2010. With the Beats 1 Radio interview, she confirmed that she had been envisioning Dirty Computer since before The ArchAndroid’s release. Quick math tells us that Janelle waited over seven years to begin the painstaking process of presenting her most personal project to the public. It took one of the greatest artists of our time over half a decade to embark upon a creative endeavor that she knew would be an essential part of her story. She had to be prompted by her team. She had to overcome her natural inclination to be hide parts of herself. Janelle had to choose the vulnerability that comes with uncompromising truth, because she knew that her message couldn’t remain an unpublished draft for any longer. I’m emphasizing the difficulty that Janelle had with this creative process not to put an asterisk on her vision, talent, or creativity. I’m focusing on her hesitance in order to reemphasize the difficulty that creatives face when it’s time to rock the boat, speak truth to power, and let go of protective barriers. Knowing you have to do something is one thing. Actually doing it? An entirely different battle. The ebb and flow of my journey is a testament to the difficulties that can come with pushing past that disconnect. I take full responsibility for my failures and shortcomings, not as a means of blaming myself for situations but as opportunities to change my present situation. One of the biggest opportunities I’ve focused on as of late is the opportunity to create something timeless. I had to make space for that opportunity. Running Artistic Manifesto in its final form required me to spend the majority of my creative energy writing, editing, and promoting content that would become irrelevant within hours of when it was published. There’s nothing wrong with music blogging, and it will always have relevance, but I realized that I would individually be better off in a different space. The routines I had fallen into were turning me into an aggregator of content, instead of a creator. I wasn’t giving myself time to create things that were worthwhile. I was rushing to document new releases as they dropped, while hundreds of other blogs scrambled to do the same thing. I was unable to grow as a writer due to the constant pressure I was placing on myself to keep up with the times. Simultaneously, I was beginning to find liberation in telling my personal story as a man who survived being expelled from his first college, jumped into entrepreneurism after realizing the fallibility of his safety net, and contemplated letting go of his dreams as reality continued to weigh heavily on his shoulders. Through my writing and social media presence, I managed to share humor and uncomfortable truths in relation to my experiences. The responses that people have seen fit to send in response to my stories and perspective keep me going. It’s easy to stay consistent because people’s feedback has shown me that my work is tangibly helping other people to navigate similar experiences, obstacles and emotions. At this point, I felt more closely tied to my purpose through my writing and storytelling than through Artistic Manifesto. I had to embrace the course of action that would allow me to continue on the path towards fulfilling my purpose, even if it required me to tear down what I had spent many years constructing. Per one of my favorite “Django Jane” lyrics, I decided to put my life’s work on the lifeline in order to free up mental space for more purposeful, unique, and valuable cultural contributions. Have you found that one thing you’re willing to risk it all for? I’m not talking about the “I hope it never happens, but this sounds good in theory” type of risk. I’m not talking about a cause that’s worth tweeting about or discussing in Instagram captions, without real life sacrifice. I’m definitely not talking about the “impulsively shoot your shot in the DM’s to get that first date” type of risk. I’m talking about feeling so strongly about a cause that you’re forced to conclude that nothing else is worth holding onto, if it dares to get in the way of that cause. Gaining a more thorough understanding of my passions allowed me to discover the causes that I’m willing to risk it all for. I’m subsequently moving with more conviction, decisiveness, and focus than ever before. I’ve been self-employed for about a year and a half now, and I’m still learning how to be my own boss. I’m still letting go of the restrictions that come with traditional employment. The more I dig into Janelle’s progression and artistry, the more I realize that she’s still learning to embrace her truest self as well. This is a Janelle Monáe ready to embrace her truest self for the greater good, despite personal misgivings that she’s been battling. Creativity isn’t just something that people manifest as a means of expressing themselves. Self-expression is certainly an important function of creativity’s existence, but creativity is also a vehicle to shape society. Artists, musicians, writers, and all creatives who share their work with the world influence those who digest their content. A Black woman with the level of fame and talent that Janelle has earned over the years can influence the thoughts of millions of people. With her latest releases and corresponding interviews, Janelle is celebrating Black women, non-heteronormative love, and the process overcoming fear en route to the fulfillment of purpose. Empowering the marginalized and inspiring people like herself is more important than fans who may be off put by her truth. For years, Janelle described herself as a “robot” to create an aura of mystique and avoid speculation about her sexuality or personal life. Things are spelled out more clearly this time. “Django Jane” includes a prominent reference to Moonlight, a 2016 movie that features a protagonist named Chiron who eventually finds comfort in embracing his bisexuality, despite the world’s tendency to shun him for it. The video for “Make Me Feel,” which co-stars renowned actress Tessa Thompson as her romantic interest, finds Janelle openly representing bisexuality. With these moments, Janelle provides rare exceptions to mainstream hip-hop culture’s tendency to overlook and suppress queer culture. The aura of mystique is still palpable but it feels like we’re getting more of a window into Janelle’s true human self as well. Janelle is being herself, and empowering others do do the same. I know how it feels to feel lost. Sleeping. Drained of everything that makes me special. It almost broke me completely several times. I’m determined to never let myself fall so deeply into that feeling again. I’m inspired by Janelle alluding to her own struggles while embracing the full spectrum of her individuality, regardless of the risks that may come with it. Comparing the challenges that I face as a heterosexual Black man to the challenges that Janelle faces as a presumably non-heterosexual Black woman would be ridiculous, and deserving of a Dora Milaje wig throw/ roundhouse kick to the face combo. Letting go of a hip-hop blog in 2018 pales in comparison to embracing personal truths that can attract homophobia and other forms of intolerance. It pales in comparison to taking potentially risky creative liberties while working with profit driven record labels, in an industry that is traditionally intolerant of women who defy restrictive cultural expectations. 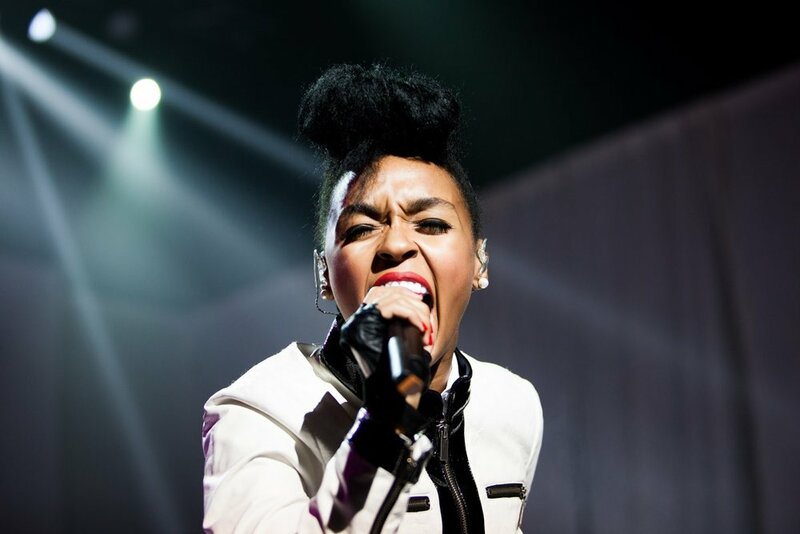 I’m not here to imply that the challenges I’ve faced are equivalent to those of Janelle Monáe. I’m here to say that 2018 Janelle Monáe has already inspired me to push past my fear of rocking the boat and letting go of my pre-established norms, even if I’m not sure what norms I want to create in their place. I feel ready to use my creativity, passion, and focus as a means to be the best “me,” and to help others in the best way that I possibly can as a part of that process. I’m here to say that I’m not going to let fear dictate how I operate, the causes I fight for, or how I live my life. I’m here to help others who feel lost or asleep in the midst of their creative journeys. I am here to choose honesty over mystery. I am here to share my unglamorous truths. I am here to reveal the painful parts of my process. I am here to push past fear, because greatness requires decisiveness. Cue the violins and violas. Dirty Computer releases on May 18th. Pre-order via iTunes. Watch the video for "Django Jane" below. Watch the video for "Make Me Feel" below. I WROTE YOU A 33-PAGE E-BOOK THAT WILL TELL YOU A BIT MORE OF MY STORY + HELP YOU TO ACHIEVE SOCIAL MEDIA SUCCESS ON YOUR OWN TERMS. CHECK OUT MY FIRST YOUTUBE VIDEO!